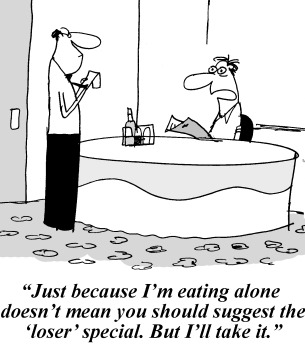 How many of us have dined alone? Eating by myself was something I never considered I would ever do. But like they say...never say never. Before you know it you will find yourself faced with a time when you have no choice but to do so. As a fresh university student some years ago, there were many instances when I would walk around discovering the new campus, attending lectures and touring the buzzing cafeteria, buying myself a a hot meal and finding a spot where I could sit and eat by myself. And I was not alone in eating alone. There were so many who did it. In the beginning, I used to find it odd, and felt uncomfortable eating by myself. And when I think about it now, it was mostly because of how I was worried about being judged by others. Would they think I am an introvert, that do not have any friends, or that no one enjoys my company? Would they think something terrible happened to me and I just want to eat in the company of my sadness? So I would then start carrying a book I could read while I ate or would begin browsing on my phone. At least that would help ward off some notions. But what does it matter anyway? These are people I did not know and probably would never cross paths with again. Now think about it in the reverse. You are at a restaurant with a bunch of your friends, happy, chatty and eager to catch up. If you spot someone seated on the adjacent table dining alone, would you not think about why? I honestly would. And mostly I feel sad and almost wish I could offer them some company and a conversation. But for all you know, the solitary diner is actually enjoying his own company, content with his meal and status quo. And he does not want to be judged. Neither does he need a book or his phone to help him wade through his lonesome meal. In fact, everyone of us should have this experience....just because!